It was hard to move to New York, and hard to leave. Both took six months, thousands of dollars, and enough tears to fill a Slurpee container (one of the big ones, the kind that are making Americans fat). Ten years after the first big move, and three months after the second, I can say both were the best decisions I’ve ever made. Moving to New York gave me my career, my husband, at least half of my closest friends. It shaped my character: I’m trusting and enthusiastic by nature, and living in New York allowed me to build some much-needed defenses. I’m not a soft touch, like I used to be, although my face still tells people I’m interested in what they have to say. It’s the best of both worlds: people rarely hit me up for money, but always tell me about their painful divorce when we’re standing in the checkout line. Moving away from New York gave me back my time, allowed me to relax, and appears to be improving my health. I do yoga here, and ride my exercise bike 50 miles a week. (Go ahead and laugh, actual athletes. That’s pretty good for me.) I go for walks. I go outside every day, no matter what the weather. 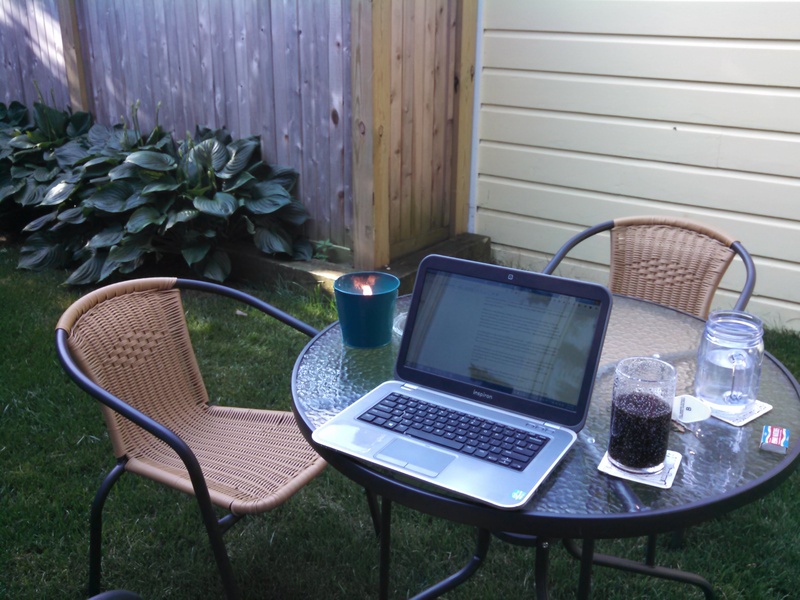 This afternoon, I worked outside on my laptop, but didn’t fall into the screen like I usually do. I spent long minutes watching the clouds go by. It would be interesting to see what my cortisol levels are. I’m glad I moved to New York, and glad I left, and even gladder that I live close enough to go back whenever I want. Maybe the best kind of escape is like when I used to run away under the dining room table when I was a kid: enough distance from the noise to encourage peace, without a major life upheaval.